In my last blogging tips post we talked about how to start a profitable blog in any niche and I mentioned how important the design of your blog is. It’s not just about having a cool theme that looks nice but having a design that speaks to your ideal readers and encapsulates your ‘brand’. My blog design came about because of a rebrand, I changed my blog name, my logo and my brand colours. I decided I wanted a light and airy theme with a feminine touch because I wanted my blog to be welcoming and positive. It obviously works because I get compliments on the look and feel of my blog all the time. I feel like you’re giving your readers an entire experience when your blog design suits your subject and your style of writing. The content of a blog definitely gets me to the blog in the first place but the look and feel and overall experience, makes me want to stay. 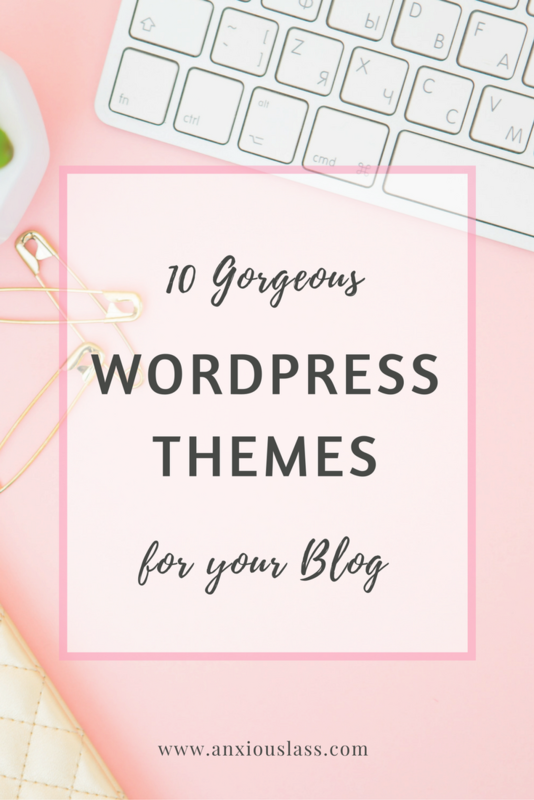 One of my favourite places to find blog themes is Creative Market, so I thought I would share with you a list of 10 Gorgeous WordPress Themes For Your Blog to make the search easier for you! There you have it! Hope you enjoyed this list and found something perfect for your blog. I actually use the Natalie theme mentioned in the list (number 4) for my photography business and I love it! If you want to learn more about installing WordPress on your blog and using WordPress themes, then check out this WordPress installation guide by SiteGround. These are so pretty! I love #1! Ahh I know, I have to resist the temptation of changing my blog layout almost daily when I’m lurking through creative market haha! Thanks for those great suggestions. Very useful and it helped me to choose my first blog theme!!!! Thank you for the great suggestions. I recently started a blog on parenting a child with severe anxiety. I have these suggestions saved for when I make the leap to a paid theme.